Chablis and the surrounding region produce great dry white wines with a mineral accent, which enjoy international acclaim. Take the time to sample these exceptional wines before exploring the terroir of Grand Auxerrois, home to a wide variety of appellations. 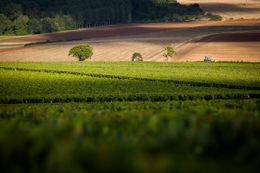 In the Chablis winegrowing area, as in the Grand Auxerrois, you will find AOC Régionales that are made right across the whole region: Bourgogne, Bourgogne Aligoté, Bourgogne Passe-tout-grains, Coteaux Bourguignons and Crémant de Bourgogne. 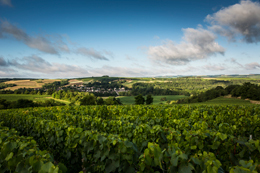 Mid-way between Beaune and Paris, the Chablis winegrowing region stretches over around 20 communes. Nestled among the valleys and wooded hilltops, the vineyards cover the hillsides running alongside the pretty Serein Valley. The vines sink their roots deep into the clay-limestone soil, drawing on them for their characteristic mineral aromas, to the delight of Chablis drinkers. Here, Chardonnay reigns supreme. It is used for all Chablis wines and has made them famous around the world. The most highly prized among them is Chablis Grand Cru, with its green-gold color and perfect balance between liveliness, dryness and acidity. You will also appreciate Chablis Premier Cru wines. This appellation encompasses a wide range of aromas from the most mineral to the most floral. Chablis wines are very dry, and stand out with their freshness and sophistication. Petit Chablis are wines rich in aromas of white blossom and citrus and are light and full of life. • Farther to the east, beyond Chablis, the vines of the Tonnerrois are found in the valley of the Armançon, the river that runs through the little town of Tonnerre. On these limestone soils, the wines are mainly produced from the traditional Bourgogne varietals of Chardonnay and Aligoté for whites, and Pinot Noir and Gamay for the reds. César for reds, and Sacy or Melon for whites are used in smaller quantities. César, which is a very old Bourgogne varietal, sometimes makes a minor appearance in certain Irancy wines. There is an exception in Saint-Bris, where the winemakers produce very aromatic whites from the Sauvignon grape.